Look for the RED. When you see RED it means changes (mostly, but not always, for the worse). This is the final part of my long-winded Hilton Hotels saga, which is dedicated to optimizing your Hilton Honor points to make them go further. In my previous installments, I covered Hilton Honors’ sweet spots and the American Express cards you can apply for to get there. We’ve also touched on how you can use these credit card benefits to your advantage. We’ve discussed which Hilton hotels you’re better off booking on cash rather than points. And we mostly covered the cheapest (but still interesting) locales with a simple goal in mind – to maximize our travel time. Besides, since I value Hilton points around $0.005, that hotel room had better cost around $475 or more to justify (theoretically) the top 95,000-point rate. Reminder: when you’re planning a stay at one of these top Hilton hotels, try to stay 5 nights to get the 5th night free benefit for elite members (and if you’re staying 10 nights, book 2 stays). Also, keep in mind that all rates are valid at the time (and even hour) of writing. 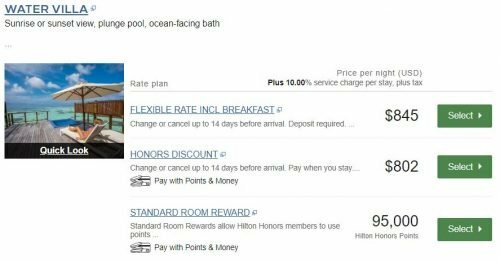 Hilton prices and rates always fluctuate, so do your own research. You might have a somewhat different experience. DoubleTree Suites by Hilton Hotel New York City – Times Square 53K-95K UPDATED 4.21.19: Closed! The location is unbeatable; the rooms are your world-famous New York size. 53,000 points a day for a 5-day stay – yes; 95,000 – no way! If I didn’t already live in this city and wanted to visit in style, I would consider The London NYC, which is being rebranded as Conrad. While, surely, not cheap at 95,000 points, this is an all-suite property near Central Park and the Theater District. This is a stunning hotel and and architectural jewel, so if you can make your stay in Chicago special and can get a room around 70,000 points, it’s not too terrible (remember, Gold and Diamond members get free breakfast now at Waldorf Astoria). The problem is, though, that the hotel has blocked all availability from June to November at this point, at least on the Hilton website. So… there is that. The Hilton site is often glitchy when you’re searching the dates for this hotel, and it sometimes shows no availability at all. When it’s not glitchy, I’ve found there is not a single day in a year that costs less than 95,000 points. This is an incredible hotel with an amazing beach and gorgeous grounds, if the points are not an issue and you can find availability. This Hilton has a very nice spa and an executive lounge that serves snacks in the evening. I don’t know if these snacks can replace dinner, but having it as an option can’t hurt in the land of $10 hot dogs. Remember I said big city properties rarely double as “destination hotels”? This Waldorf Astoria seems to be not just one of the top Hilton hotels, but also one of the rare exceptions. Incorporating several 17th century palaces, the hotel features every luxury in the book including a personal concierge. However, I’ve failed to find 5 consecutive days available from spring to fall to justify the 95,000-points rate. If you want to travel to the Netherlands in or after November, you can have it for (start laughing) 93,000 points a night, but you might want to be prepared to spend most of your time inside if the weather doesn’t cooperate. Which, admittedly, shouldn’t be too difficult because the place is truly fabulous. 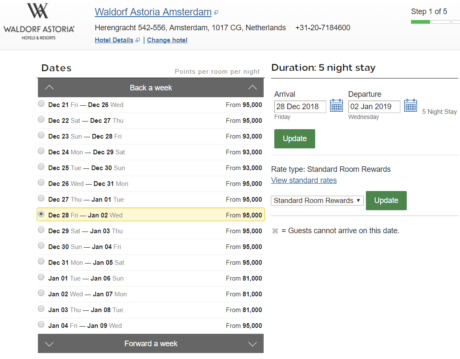 Or, for a really special vacation, go to Amsterdam on a Christmas week or New Year’s Eve. I was a bit surprised to find availability wide open for that time of the year. If you have to go to famed Ibiza to see what it’s all about, staying here will likely cost you 380,000 points for 5 days. Why? Because you don’t want to go to Ibiza in winter, or spring, and, unfortunately, every day between June and September costs 95,000 points at this hotel. Now, Octobers are still warm in Ibiza, so you can save a little, but you will still pay 88,000 points per night. OK, been there, done that. Unfortunately, I haven’t found a single date that would cost less than 95,000 points. Is it worth it? Everyone knows about this unique resort featuring ocean-view villas with private pools, and as a once-in-a-lifetime experience, I’d have to say yes. Then again, in 2013, I paid only 145,000 Hilton points for my 5-night stay, and not the 380,000 points it would cost you now for the same experience. Gee, time flies even faster in the “loyalty” world, doesn’t it? If you want a shot at getting upgraded to an overwater bungalow, try to stay here. Yes, Hilton also has ultra-luxury properties on Bora Bora and in the Maldives, but I’ve only found a couple of available dates on Bora Bora (and the Maldives are never below 95,000 points). If you must have this experience, try to get Hilton Moorea first. Sure, there is that ultra-luxurious Waldorf Astoria Maldives Ithaafushi priced at 120,000 points for a regular room (although a regular room at that resort is a 2,500 sq ft pool villa) , and a much cheaper new property SAii Lagoon Maldives (available after August 1 for “only” 76,000 points). However if you don’t mind to drop 95,000 points, I believe the best deal is Conrad Maldives Rangali Island. Why? Because 95,000 points get you an overwater bungalow. 95,000 points will get you an overwater villa — no upgrade necessary! Hilton also has another property in the Seychelles – Northolme Resort & Spa – but that one goes for 95,000 points every day of the year (again, at the time of writing). The Labriz costs 80,000 points a day, and if you’re a Diamond, you might have a shot at upgrading to the beach villa with a private pool. UPDATED 4.21.19: There is yet another Hilton property on the Seychelles, DoubleTree Allamanda Resort and Spa (70K per night), but some reviews suggest it’s a bit worn out. Would I spend 95,000 points a night there? 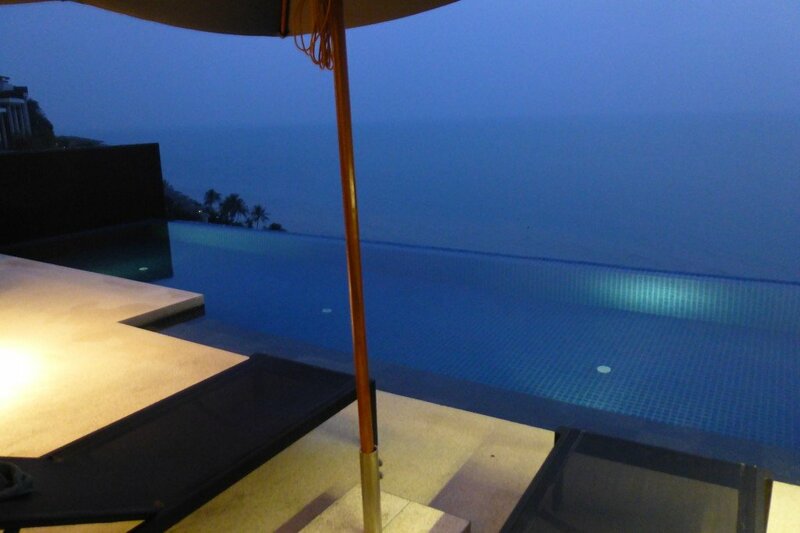 No, but this amazing onsen (spa) resort can be a good buy if you find a room at the cheaper end of the spectrum. Reportedly, there isn’t much to see and do around the town (and the resort is a bit away from the town in the first place), but this property is perfect to relax and unwind in the onsen, or one of several uniquely-designed swimming pools. Odawara is just a 35-minute train ride away from Tokyo, which makes it a great overnight or weekend trip. Always search anonymously, e.g. in Chrome Incognito. Don’t log on, it won’t change a thing (you know you’re getting the 5th night free anyway if you have a Hilton credit card). When they freeze you (and they will, eventually) close your Incognito window, go back to your regular browser, and open the Incognito window again. It’s that easy! Is this list of top Hilton hotels exhaustive? Of course not! Just treat it as yet another suggestion of what you can do with your Hilton points. There are other aspirational Hilton properties around the world you might enjoy, and, if you have any personal experiences, please share them in the comments. In the update to this 3-part miniseries, I’ve featured 40 Hilton hotels in the Americas and Europe, 13 in Asia, Africa, and the Middle East, and 12 top-of-the-line Hilton hotels that might make sense to book on points due to the points/cash ratio. Here are the redemption changes that have occurred in the last 6 months. The top Hilton hotels: 3 have increased and 3 have decreased. Keep in mind, I’ve added a few hotels that I didn’t feature last time around. While these changes are not overly dramatic, and, let’s be fair, I’ve only checked about 60 properties, I’m inclined to downgrade the Hilton Honors value from 0.5x to 0.4x. Of course, once again, remember that with point redemptions you’re not paying taxes, and, most importantly, you’re getting the 5th night for free if you can use it. Update: Hilton Honor Points in Asia, Africa and the Middle East — Are There Any Deals Left?